Argument # 8 – Israel Gave their Tithes to the Storehouse, So We Should Give our Tithes to the Church. There are good principles we can draw from Malachi 3, but using the storehouse as an argument to bring tithing to Church is not accurate. Yes. We should supply ministers and the Church body with food and provisions for their needs, but the principle in Malachi 3:10 is about supplying for the needs of others; it is not about giving 10% to a Church. Here are 3 areas to review on why the Church is not a storehouse for tithing. The temple storehouse only received 1% of Israel’s increase, the other 9% was stored in Levitical cities – not at a place of worship. Nehemiah 10:37-38 to bring the firstfruits of our dough, our offerings, the fruit from all kinds of trees, the new wine and oil, to the priests, to the storerooms of the house of our God; and to bring the tithes of our land to the Levites, for the Levites should receive the tithes in all our farming communities. And the priest, the descendant of Aaron, shall be with the Levites when the Levites receive tithes; and the Levites shall bring up a tenth of the tithes to the house of our God, to the rooms of the storehouse. The irony of all this is that the decree in Malachi 3:10 was not addressing the whole Israelite nation. It was only addressing the Levitical tribe since they were the only ones responsible for the 1% that was suppose to bring food to God’s StoreHouse. As a word of wisdom to leaders in our Churches who may be reading this – In Malachi 3, it was those who received the tithe that were neglecting their duties to give. Considering 85% is spent on internal operations, i don’t think we’re any better off than those in Malachi were . . . what a scary thought! If you wish to read more about the Levitical cities, they are first outlined in Numbers 35:2-3, while other references can be found throughout scripture in regards to the storage of tithes and offerings within these cities as well. Did Your Church Build a Storehouse? A storehouse actually STORES something. Duh! Right! If you had a storehouse for your farm, that means you are safekeeping your grain to be used later for feed or for seed. The Church building, is not used as storage to preserve or distribute anything. Quite simple to understand, don’t you think? Most people don’t pick up on the fact that Malachi 3:10 mentions two different places. First, God mentions a “storehouse”; then, God mentions a separate place and calls it “my house”. The two are exclusive of one another. God’s house is NOT the storehouse, and the storehouse is NOT God’s house. Did you think the grain was sitting in the Holy of Holies? Maybe they stored some of their corn in the ark of the covenant? 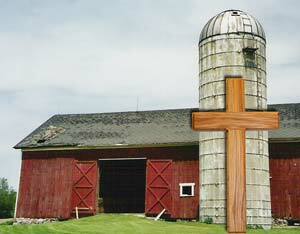 There was no Shekinah Glory sitting above the grain house. God’s house was not a place to bring your goods or possessions. Neither was it a place to make transactions. God kicked ALL the money changers out. There were no exceptions for those who were honest and those who were dishonest. Jesus statement was that in the presence of God, there was to be prayer, not business. I know that i stated the temple is not the Church building today, so it’s not like these restrictions in the Temple are applicable to worship buildings today, but this means if these restrictions aren’t applicable, then it also means that the Church building is not a resemblance of the Storehouse or the Temple. The storehouse was was not considered a holy place or part of the worship process. The only reason why a storehouse was needed was because there was food to store. If you are unaware of the temple tax; it was a monetary offering required for everyone to pay for the upkeep and maintenance of the House of God. The temple tax was never kept in a storehouse. So, God doesn’t need a storehouse in order for us to have a reason to give to support His work. One last note. If you observe the New Testament, there is no reference to a Church storeroom to bring your tithes or offerings. Nor was the word ‘storehouse’ mentioned whatsoever. Let’s set aside the technicalities and semantics and focus on the spiritual application of a storehouse. Some of you believe that the Storehouse in the Old Testament, through spiritual meaning, is comparative to a church today. I get why this thought occurs to most people. But let me show you two significant differences between a church and the Temple and a storehouse. In the Old Testament the Temple was known as the House of God, but in the New Testament we know that God does not dwell in houses made with hands. We are the temple of God. The earthly Storehouse symbolizes the purpose of an eternal storehouse, it does not symbolize a worship building or any other form of infrastructure you may have for the local Church. The storehouse symbolism is perfectly described in Matthew 6:19-20 where Jesus commands us not to store up treasure on earth, but to store treasure in heaven. It’s a disservice to consider your worship building God’s Storehouse. I know there are many great programs and actions that come through some local churches and their facilities, but certainly God did not want us to focus on earthly legacies. He wanted us to focus on eternal legacies. If anything, Malachi 3:10 should be a reminder to lay up treasures in heaven, not to bring a check to the next service. Here is a review of the key points from the article. The Temple was not a building to store money or goods, and was not used for any financial transactions. A Storehouse was Not needed unless there was something to store. God no longer resides in a building and our storehouse is found in heaven, not on earth. If a Church wants to consider itself a storehouse for tithing, then by all means make sure they follow the guidelines in the Old Testament. Otherwise, let’s not call the Church building a storehouse. In the mean time, let’s encourage one another to give as God leads us. May it be sacrificially, liberally and cheerfully. Do You Think the Church is a Storehouse for Tithing? A little thought on the principle of tithing. Whuch I fully believe is giving 1/10th of the first of your income to God via your home church “storehouse”. It’s the household of faith, where we serve one another, fellowship, and receive ministry in the Word. But concerning the tithe, let’s not forget “the Rule of First Mention”. The first tithe (1/10th) ever given was by Abraham, it had nothing to do with the Law, but out of his heart to love and honor God, Abraham tithed. It was later inducted into the Law as a practice to remind the Israelite’s of Abraham’s act of love, faith, and thanksgiving towards God. The writer of Hebrews says that we are connected to the promise and blessing’s of Abraham through Christ. We need to stop treating tithing like it was a curse under the Law. It was never a curse, but a representation and reminder of the blessing of being in covenant with God. The true issue behind those who vehemently argue against the tithe, is a trust and obedience issue. Plain and simple. Many use “Well God loves a cheerful giver.” as an excuse to give less than 10%. Yes God does love a cheerful giver, but can we not give our tithe with a “cheerful heart”? The only one who chooses to give “begrudgingly” is us. My wife and I have been giving the tithe (and offerings) cheerfully and faithfully in whatever local church we were attending for 17 years of our marriage, and individually before we were married. We have zero regrets because we gave and still give it cheerfully.? Anti-tithing proponents love to relegate things they don’t agree with to falling under the Law, yet Paul the Apostle used the Law frequently to prove a practice in the New Testament. “Who serves as a soldier at his own expense? Who plants a vineyard and does not eat its grapes? Who tends a flock and does not drink the milk? 8 Do I say this merely on human authority? Doesn’t the Law say the same thing? 9 For it is written IN THE LAW of Moses: “Do not muzzle an ox while it is treading out the grain.” Is it about oxen that God is concerned? 10 Surely he says this for us, doesn’t he? Yes, this was written for us, because whoever plows and threshes should be able to do so in the hope of sharing in the harvest. 11 If we have sown spiritual seed among you, is it too much if we reap a material harvest from you? 12 If others have this right of support from you, shouldn’t we have it all the more? Now Paul CHOSE to not use this right, but he STRONGLY defended the right using THE LAW as proof nonetheless. Even the devil knows the word of God. You speak mistruth. Did Jesus complain when he carried his cross yet never sinned but only loved others. He shared the everlasting promise to all who had faith and believed in his Father in heaven. He gave thanks first to his Father and he prayed incessantly to Him. He over turned the tables exchanging money. Your defense is that Paul said he deserves material things for how hard he worked? Does Paul forget he came naked and naked he returns to earth? Bring all the tithes into the storehouse so they’ll be food in my house said Jesus. That means you go and pet someone in the back or you give someone a smile or you pay for their meal or you buy someone a car or maybe you go and care for someone when they’re sick or maybe even when you’re out and about you just do some simple act of kindness because God loves all of his children and we are all one and as he says before you bring your offerings to the altar go make right with your brother first!!! God is Love. Love conquers all. ok I’ve brought tithe faithfull 10% and 5% in offerings, I recently had a serious surgery not once was I visited at the hospital or home just sent a text all the while my wife still sent tithing and offering. What would you do? Also I did go up for prayer hoping for a miracle or a healing instead of surgery I dont blame anyone but am left bewidered. the attendace is anywhere from 200 to 350 people but feel like if you’re going to preach Malachi then don’t stand on the abrahamic 10% to melchisedec Faith or stand on both of them but if you’re going to preach tithing and use Malachi then there ought to be a storehouse and the money should be distributed remember Abraham had man manservants all types of things they went to battle and he gave a tenth of the spoils to melchisedec. So let’s not leave that out it was a tenth of what they raided from other people, so what are you going to stand on? Do I need to go raiding the enemy as Abraham did in Genesis chapter 14 taking their belongings and bring it to the church or should there be a storehouse for me to bring a tenth to because either way your argument is lacking. Abraham actually kept nothing for himself only got his brother back his belongings women children Etc and whatever the men eight and used he said these things ain’t going to make me Rich the king of Sodom wasn’t going to take credit God had already blessed Abram and Abram was not going to give the credit to anybody else but God so what do you think? It’s funny, I came on this site to get a better understanding of what a storehouse was but seeing the response to word of truth that was shared, I feel compelled to share from another perspective….Tithing is not about patting someone on the back or buying someone a meal. When Jesus said “Bring all the tithes into the storehouse so they’ll be food in my house” he was not just referring to natural food but spiritual. Without the natural means (money) to take care of the house of God, the doors would close, and the spiritual food (Word of God) would not be able to be shared with the people. Tithing is about giving back to God what is already His in the first place. In Malachi when God says “will a man rob God” he was not only referring to money but of our time, talents, creativity, and anything else we have to offer. He requires a 1oth as a means to see our willingness to obey, and in turn He will “rebuke the devour,” which again does not only mean only our money, but our family, our health, our children/grandchildren, etc. The devour comes when we decide that we will either A) not give God a tenth of all our increase (disobedience) or B) do it with a grudging heart (greedy spirit). Tithes and offering are two different things. Offering allows God an opportunity to give his people increase. The argument that the devil knows the word is true but the word of God also says “My people parish because of a lack of knowledge.” He says for us to “study the Word to show ourselves approved” and in “all that we get to get understanding.” What happens is that we do not want to give of our finances so we believe it to be a “mistruth.” The devil is a lie and he will blind our eyes to the truth if we let him but when we resist the devil he has to flee. But that is why God says “try me now in this” in Malachi. I tried Him and seen Him move on my behalf. As a baby in Christ in 2008, I went from only having $241 a month to survive on with 3 kids (2 smalls ones) in the house (and I paid my tithes faithfully), to a job I was not qualified for in 2011 and making more than I ever thought I would be able to today without a degree. May the eyes of your understanding be enlightened to the revelatory word of God. Thithing was for the levites . The Levites were given no inheritance. The offering where an ordinance as where the burnt offering for sin . The Livites took care of the Ark of the Covenant, the Tempel and altar and burnt offerings. The Levites got the 10% for they were the Preist and had no inheritance and the rest, 90% was for God and to do with as God commanded . Man could not find salvation in the law because they could not keep the law. Jesus gave his life for our sins and to defeat death which is the Devil . God does not want our burnt offering, God wants our love. That’s why God himself walked in the flesh . I’m the beginning was the Word , and the Word was God . The same was in the beginning with God. All things were made by God ; and without God was not anything made that was made. In God God was life ; and the life was the light of men. And the light shineth in darkness; and the dark comprehended it not. And the Word was made flesh , and dwelt among us . Give freely the word , be chairitble, joyful . A pasture or teacher is due is pay but a pasture , preacher or what ever he calls himself is in it for fame and fortune is not called of God . God didnt bless you because you paid tithing faithfully, he blessed you because of your faith. People pay tithes and nothing never happens, that’s because their lack of faith. Once you understand that faith moves mountains you will then understand that it wasn’t your money that moved God. `Kristin M Dunn is absolutely right!! Bringing our tithes into the Storehouse is helping our Fellow Man through the Love of giving to those in need. That scripture plainly tells us the storehouse is heaven, and when we depart this beautiful earth that God has put us on to do his work, we will be rewarded by God by dwelling with him in Heaven. Abraham actually kept nothing for himself only got his brother back his belongings women children Etc and whatever the men eight and used he said these things ain’t going to make me Rich the king of Sodom wasn’t going to take credit God had already blessed Abraham and Abraham was not going to give the credit to anybody else but God so what do you think? Jesus said to Peter on this rock I will build my church and another says my body is the temple of the Holy Spirit, another says look for a place that will carry my name and thou shall assemble in that place at certain times, the place is a tebarnacle, now tell me, which of these is the storehouse? The tithe is the first fruit of our harvest but already when we receive our salaries, tax and other deductions have already been paid. Are we really giving priority to God or government? The Bible talks about the workers sharing the tithe and the priest being given the tithe of the tithe. Are our ushers in today’s church being paid or all is going to church? God is looking for distributors not people who will store wealth and buy expensive cars, mansions when others lack. God is love and His first characteristic is givin, for He gave His only begotten Son… Is your tabernacle giving to the poor? Is it looking after widows and orphans? Not judging but God’s people perish because of lack of knowledge. God gave us the spirit of truth and sound mind not confusion. I read more than 10 verses that talk about God delighting only in thanksgiving and praise. To be honest, to me tithe is a seed, I cannot eat the seed but sow and in every fruit is a seed. But do you sow one crop in the same land or you sow your seed all around and do crop rotation. Members give tithe and also partner with ministries, which is which? Members are made to believe they are preventing pests and all that, in other words tithe is insurance. Knowing my Father, no value of money can ever buy him or His love. He says freely I have given, you see there is no charge there. What about Jacob, He anointed a rock as his place of tithe? Again there is instruction to keep tithe and in the 3rd month of Abib, you distribute or if the place you chose to give your tithe to is far, you choose a place and go and spend all of it there. Why then are we not mentioning this? And it also says if anyone comes seeking help, you take from tithe and help. But when food is more than enough in the house is it still right to keep collecting despite the fact that you have more than you need? The whole chapter of Hebrews 7 was about tithing and Paul made it clear that, ” Because there was a change in the priesthood, there was a change in the law (tithing law). Please prayfully go into the new testament deeply Jason, and ask God to help u get the right understanding about tithing. If your heart is right, u will change your mind. It is very, very wrong to give so much money to a pastor to support his lifestyle when there are so many underprivileged people in need of financial help. What a terrible example we set to our communities when we don’t help those that are struggling and our pastors are travelling around the world on member’s tithes and living in nice homes. I doubt God had any “law of first mention” in mind when he inspired his authors to write scripture. You can’t interpret anything on the basis of this law of first mention. Fact of the matter is, tithing is not a requirement for the church. All of the other stuff you said sounds nice, but lets just stick to the facts. Tithing is law. Thats it! There is no such thing in scriptures as the principle of tithing. It is a scam and a lie to convince People to tithe 10% of their monetary income to a church/padtor which God never commanded. There are many principles on giving in the Bible, like if you saw bountifully you will reap bountifully, a.s.o. There is a great joy in giving. But I think it has not only to do with money, but also giving your time to for example the poor, the needy a.s.o. God promises you will not have any need yourself ! Paying every month (not biblical) you tithes to a church can be as a yoke and will cause you headache every time to be sure you give enough tithes ! The whole tithingproblem is solved by giving more than tithes if you are able, but do it with a joyful heart ! God loves the joyful giver ! The Abraham tithe was of the spoils NOT his income or even of his land. The tithe became law to the Levicitical priests (Priests under the order of Aaron) as God said they would have no portion. Once the Levicitical priests ceased to exist when Jesus the High Priest under the order of Melchizedek, this tithe was done away with. The “church tithe” so many pastors don’t understand and misuse to gain money was a Jewish Pharisee temple tax. They charged 2 shekels to enter the synagogue. It was NOT a tithe. Lastly the tithe was never money. It was only ever referred to as the fruit of the LAND. Think there is multiple parts to tithing need to look at not just financially. How do you spend time, money, mental time, physical energy, towards God or on world? Also how much you investing in God in self? in prayer, Word, fasting, worship and most importantly serving God in community in people (Matthew 25) being salt in world and hallowing investing His kingdom here on earth with time as well as money. Last part referring to more business as missions. That that is one return on investment (ROI) that will keep on giving. That is truly I believe storing up treasures in heaven and a real reflection of where your heart is. In regards to investing into your church think it all goes into where are they stewarding the funds, how are they investing it. Same scripture applies to churchs “for where treasure is that is where heart (church) is also” churchs should and need to have outreach and evangelism team, discipleship training (not talking small groups) but Fellowship is very important. Partnerships with agency’s that are already serving. Look and see where church is spending money and it will show you it’s heart. Discern and invest wisely. But always into God! No doubt. But how do is not so black and white. Everything ends up with our attitude of giving. May you use the tithe as your measurement of giving or not – the way I see it always goes back to love. Brown said “you can give without loving, but you cannot love without giving”. John in his epistles points out that obedience is a clear sign of love for God. I use the tithe as a starter in my giving and gradually increases it simply because I love God. May the church use it for the ministry or may they not be a good steward, i will still reap the blessing promised because I obey. The tithe is the minimum that we are to give. We are instructed to tithe in the New Testament, but you are right, under grace it becomes an issue of the heart, but it does not disappear. I respect the fact that you love God and serve Him, but I guess we will have to agree to disagree. I love your reference to Mathew and what Jesus said about the Law. Now, let me ask you a question. Did he fulfill the law? Did he do what he said he came to do or did he leave it undone. Did he accomplish all? If he didn’t, then his work is not complete and Jesus did not do what he said he came to do. However, we know Jesus fulfilled the law and completed the work as he said, it is finished. This, the law was never abolished, it was fulfilled and nailed to the cross. Wow! Thanx Josh. So the the law’s fullfillment is done in one person; YESHUA. This is unacceptable to the law keepers; to them the law remains unfullfilled as a sapegoat.If their arguement is true I am wondering, what YESHUA meant when HE uttered “It is finished” while hanging on the cross. By the way,. Beloved brothers and sisters :) hehe. God knows those who are His anyways,. I do give but not to these people who are building these great big million dollar buildings and spending our money on lustful worldy living,. I give as God leads to people in need,. I would really like to see those churches and church people go out into the highways and byways the needy and make it a heart issue to minister to the lost and there needs,. true religion is this: to care for the orphan and the widow,. the needy,. Quit being greedy Church, go buy a lotto ticket if you want to get rich(1 Timothy 6:8-10)God does not provide your Greeds… and Pastors put that faith you claim to have “On God” quit taking the peoples money…. It’s not people’s money. God expect us to give. What the leaders do with it,it’s up to them. Giving is a Biblical principle. What ever we have belongs to GOD. Quite simply. Tithing was an ordinance of the law from Numbers chapter 18. This is what the Levites broke and why God was rebuking them in Malachi 3. However, Jesus then fulfilled the law and all of the ordinances (tithing included) were nailed to the cross. Colossians 3. God Bless you all. If there is a storehouse of any kind in today’s society whether its monetary, food supply, clothing, shelter of some kind, there must be a provision to liberally help the poor and needy. And it must be done without placing them in long lines to further humiliate them. God is Love! No love, no God! I don’t mean to argue but storehouse in Malachi 3:10 refers to our local church where God planted us. Food means that the ministers (pastors, full-time church staff etc.) are provided for by God. Why did only 1% only make it as tithes? Because the Levites received God’s provision by the tithes of the other Israelites. And since the Levites know God’s Word, then they must also bring their tithes as submission to God’s authority. Bringing tithes symbolizes our submission to God’s authority over our lives. It started since the creation (Genesis 1-3). Adam and Eve rebelled against God by eating the fruit from the tree God told them not to eat from. The verse “Store your treasures up in heaven…” is a completely different subject. Remember the verse, “For where your treasure is, there your heart will be also.” This meant that we shouldn’t set our hearts on earthly materials but on heaven alone. Let me illustrate what you did here . . . .
And the accusation is that the verse about storing up treasures in heaven is irrelevant to an Old Testament storehouse? Your response was a valiant effort that fell short, but the good thing is, you get to another chance to make up for it. NO IT DOESN’T…the storehouse DOES NOT REFER TO OUR LOCAL CHURCH!!! There seems to be a disconnect here from some simple common sense, or maybe I missed something in the argument. Our first fruits today are very different from back then. If you take that literally we don’t have homegrown food or livestock that we would carry to a storehouse for those in service to use for sacrifice, themselves etc… We, for the most part, receive a wage and then pay our 10% from that. That storehouse then is comparable to a bank (or temporarily a safe) that the church would use to store those goods and use for ministry. I would have a hard time believing that God would place men in ministry and then not expect that our “first fruits” not help take care of them. Seems irresponsible to me, but then again I’m just a pew warmer. I think the greater response to that verse in Malachi is, that you cannot out give God and He is saying to challenge Him in faith and see. No, we don’t give 10% of our paychecks as tithe. And no the storehouse is not analogous to a bank. The fact is, that tithing is not for today..its that simple. It amazes me how such a humbling article can stir up a diversity of cultural and religious beliefs. We all are entitled to believe what we want. But, the Word of God clarifies what “we” were conditioned to believe. We were conditioned to believe to give your 10th to the church.. and do you know what your church does with the hard earn money you worked for to offer it up to God? Let’s say the statistics are true, and only 1% of your tithe goes to the storehouse, then this may be the reason why the church is so limited in helping those in need. So, I feel free. I rather seek God’s command, and give to others who are in serious need, than to give to a church, who will turn their back on you because you don’t tithe, or refuse to help you with an energy bill to keep the family warm in winter, simply because they don’t have it. Then, what is the purpose? If we are the temple of God and He dwells in us, why are so many of “us” walking around in guilt because we don’t tithe to church? We can all have our difference of opinion; but, when the time comes to truly prove in your heart that you are storing up treasures in heaven, what will you do? Will you turn your back on someone begging for food, because you have to tithe to the church? Will you not help a friend who lost a job? Will you put grocery bags together and pass them to families? Are you willing to help a family who was homeless? I just believe all the pompous nonsense needs to stop and “we” all learn and be more like Jesus. You are making scripture say what it was never mean;t to say to begin with…this should be common sense. Stop reading your pre-held beliefs into it. 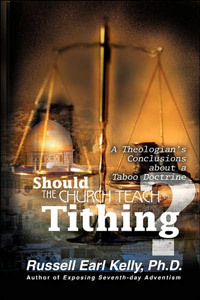 No where in the NT is the Church commanded to tithe. Tithe teachers who use the Gen 14:20 Abramic tithe, Gen 28: 22 Jacob vow tithe, Mal 3:10 tithe or the Mat 23:23 Jesus taught tithing is deception at it’s best. People who pay 10% of their monetary income to a church/pastor need to study OT agriclture/fruit/herds as commanded by God versus NT free-will giving cimmanded by God.Church members have been lied to for decades now because pastors themselves don’t and have not studied God’s Word regarding this subject. The use of OT scriptures out of context to justify NT tithing for believers is a lie. God never commanded monetary tithes for His Church. 2 Cor 9:7 is God’s system to support local churches. As the law if tithing was one of 613 laws given by God through Moses to the Israelites only (never for gentiles) those laws were abolished when nailed to the Cross. The tithe law ended at the Cross with all the other 612 laws. Heb 7:5; Gen 7:12; Gen 7:18; Eph 2:15; Col 2:14; Gal 4:5; Gal 3:10. Church leaders decided that they wou ignore God’s Word regarding His Holy Tithe and enforce a monetary tithe upon God’s people. Monetary tithescwere never commanded by God….never. It is man fabricated and foreign to the scriptures. People must wake up to the lies propagated from pulpits regarding tithes and study the Word for themselves. Apostle Paul said to be like the noble bereand and study the Word. Here is more proof scriptures of the 613 laws being abolished. Mat 26:26-28; Heb 9:16-17; Heb 8:13; Col 2:13-17; Gal 5:18; Heb 8: 6-7,18; Gal 3:19; Gal 3:23-25; Gal 3:10-14. Church leaders will most times agree that the law has been abolished but very conveniently just hold onto the One law that they have changed into a money cow…..the tithe, but ignore the other 612. Yet Gal 3:10 makes them guilty if all the laws.